The 2018 Monmouth County Cross Country Championships brought us three first time champions and continued one long running tradition of excellence. What a meet for the Holmdel Hornets! The girls of Holmdel won the first Monmouth County cross country team title in school history on Tuesday. It came after an early battle with NJ#6 Colts Neck who scored two of their runners ahead of the first finisher for Holmdel. After that initial sting it was all Holmdel from there scoring their fifth by place 22nd and only splitting 45 seconds between their top five with a 19:52 average. The squad was led to victory by Emily Levonas in eighth running 19:37, Claudia Zhang ninth 19:40, Caitlyn Joyce 13th 19:48, Nicole Sportelli 16th 19:53, and Alexa Blasiak 22nd 20:23. The individual girls champion and Colts Neck's first finisher was senior Delia Russo who crossed the line at 18:44, a course PR by 50 seconds! She's had a great start to the season and now has her first individual county title. The last Colts Neck individual champions came during a three year run just over a decade ago when Briana Jackucewicz won in 2007 and Ashley Higginson 2005 and 2006. There was plenty of talent out front on Tuesday, Corina Vidal of Henry Hudson and Maddy Kopec of Red Bank Catholic also broke 19 minutes in second and third. Amanda Stone of Monmouth Regional, 19:22, and Natalie Shapiro of Colts Neck, 19:28, closed out the meet's top five. The boys side saw a first time county champion as well with Colin Flood of Manasquan. After a battle to the line with Freehold Twp's Nick Lundberg he crossed at 16:04, Lundberg 16:06, and is knocking on that sub-16 minute barrier at Holmdel Park. 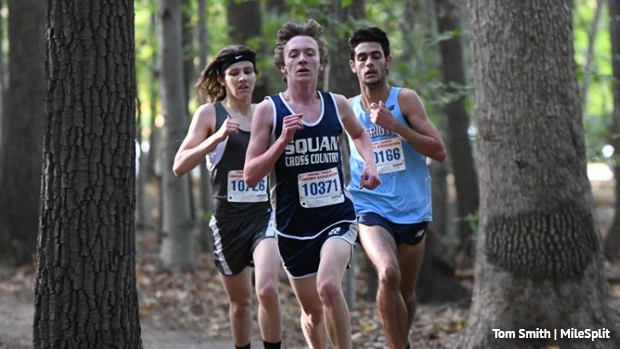 He's Manasquan's first county XC winner since 1975 when Chuck Ferrel won his second straight. This is the fourth win of the season for Flood who's also seen gold at the Thompson Park Class Meet, Six Flags Wild Safari Invite, and A Central Divisional. As mentioned Nick Lundberg finished second, 16:06, followed by Tyler Schwinn of Red Bank Regional, 16:19, TJ Hillyer of Howell, 16:35, and Dylan Mannion of Ocean Township, 16:36. All this and we haven't even touched upon the CBA title streak continuing. Now 17 straight years of Monmouth County XC Championships for the Christian Brothers Academy boys. The last team without CBA on their chests to win was Red Bank Regional back in 2001, and that was just a hiccup at the end of a separate 19 year run for CBA now owning a total of 49 just for cross country. This year's team scored 51 points (8+9+10+11+13) and split a mere three seconds!! While averaging 16:50 across their top five. The amazing three second compression was started off by Tristan Amell in eighth running 16:49, then Tim McInerney ninth 16:49, Tim Cahill 10th 16:50, Tanner Crochet 11th 16:50, and finally Ben Santos 13th 16:52. Their displacers weren't too far off either with Chris DeSousa in 15th at 16:54 and Sean Elliot 19th at 17:12.